04-Jan-2019: A research team led by scientists at the Columbia University Mailman School of Public Health report on a new method to help health officials control outbreaks of methicillin-resistant Staphylococcus aureus, or MRSA, a life-threatening antibiotic-resistant infection often seen in hospitals. The researchers are the first to reveal the invisible dynamics governing the spread of these outbreaks and demonstrate a new, more effective method to prevent their spread. The research team developed a computer model of MRSA outbreaks using more than 2 million admission records from 66 hospitals in Stockholm County, Sweden, representing a period of six years. 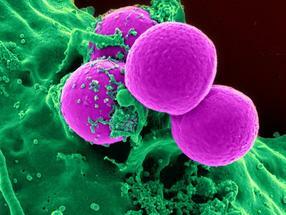 Their model recreated outbreaks of the most prevalent MRSA strain, UK EMRSA-15, which is present in 16 countries worldwide, including the United States. Adapting statistical techniques used in weather forecasting, the model simulates two connected dynamics at the individual scale: transmission within hospitals and infections imported from the community. Information on when and where patients were admitted and discharged and who was diagnosed for MRSA is used to reveal a group of "stealth colonizers"--individuals who are infectious but whose status is invisible. "Compared with traditional intervention strategies that may overlook a considerable number of invisible colonized patients, this new model-inference system can identify a pivotal group for treatment, namely individuals who may otherwise transmit MRSA asymptomatically," says first author Sen Pei, a postdoctoral research scientist in the Department of Environmental Health Sciences at the Columbia Mailman School. The researchers first validated their inference method using virtual outbreaks generated with the computer model. Unlike records from the hospital, where only infections are observed, this model-generated outbreak "observes" all outbreak characteristics (e.g., the number of "stealth" colonized patients). They then used the simulated observations of infection as input for their model-inference method and were able to reliably estimate the hidden dynamics of the virtual outbreak, including rates of MRSA importation from the community and numbers of colonized patients. These findings confirmed the validity of the approach and motivated its application to the Swedish hospital data. "Our method provides a powerful and cost-effective way for hospitals and public health officials to contain outbreaks of MRSA and other antibiotic-resistant infections as they become increasingly common," says senior author Jeffrey Shaman, associate professor of Environmental Health Sciences at Columbia Mailman.